Mike and Jim came up to fish the Caney Fork River via Woodstock GA. I met them at Mike's motor home and we loaded their gear into the truck for the quick ride to the access. 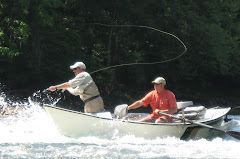 Mike has been fly fishing for over twenty years and Jim has been fly fishing a little less than ten years. Both are accomplished anglers and we went searching for bigger fish. The day started out with a little fog, but it was predicted to be sunny and hot. Mike took the rear casting brace, while Jim fished from the front deck of the drifter. Jim started the day off with a bluegill and quickly moved onto trout when the water turned off. As the water began to settle down Mike joined in with some bows of his own. We fished nymphs early among the many canoes, boats and pontoons. It was combat fishing at its finest. The guys were troopers though and never complained...but we did have some good discussion. One part of the dam repairs consists of drilling over 1100 holes in the limestone and filling the holes with grout. The water level in the lake needs to remain approximately 630 feet (above mean sea level). The Army Corps is charged with keeping the lake level at about 630, therefore the releases, from the dam, will track pretty close to the rainfall. The easy way to remember the water release process while the repairs are underway is....Water In Water Out. So the guys continued fishing nymphs, we added streamers, then went with dries and other topwater patterns. They caught their share of the usual fish and Jim completed a slam, but we didn't hook up with the big one, this time. It certainly wasn't from their lack of effort. These two were troopers and fished hard up until the end. Jim threw the streamer all the way to the ramp as the sun disappeared and the thunderstorms moved into the area. It was a pleasure to fish with a couple of fine anglers and genuinely nice guys for the day. 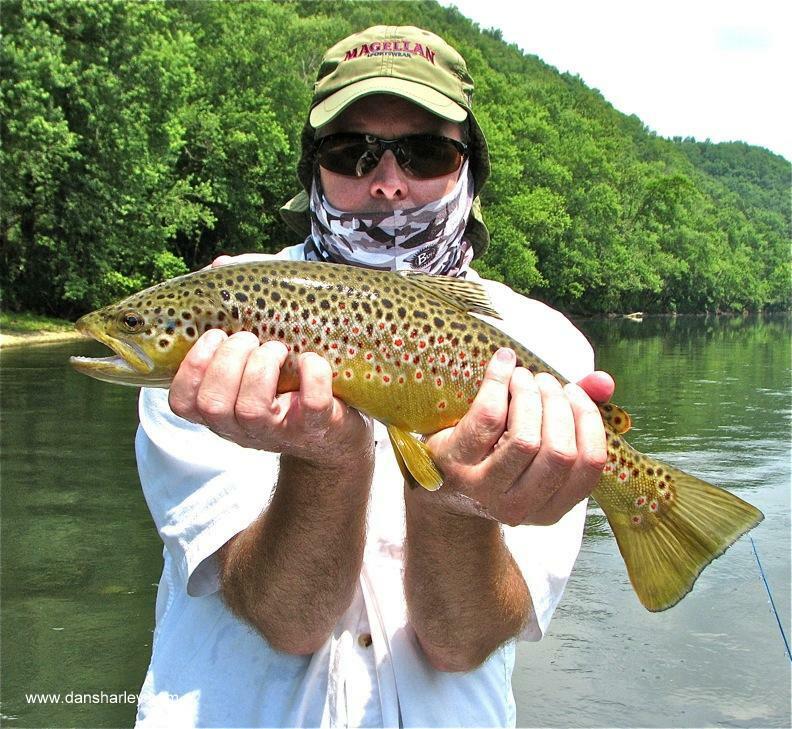 We have been back on the water this week and specifically the Caney Fork. The dam has been the talk of all us river rats since last year. The repairs are supposed to cost upwards of $300,000,000.00 and take seven years. While the Army Corps fixes the seep water and cracks, I decided to go find the fish, cause they are there....somewhere. We hooked up early, well Dan, hooked up early and we boated some hatchery brats. But, on this day we gravitated back to throwing streamers for larger fish. It was hot, real hot and I must admit the heat won. The next thing we knew the boat was parked on a gravel bar and we were wet wading. I ended up on nymphs pretty early while Dan and Mark stayed on streamers a bit longer. The water continued to fall out. We saw some folks who thought the water was still a little high. The water level was keeping the fish from playing. We agreed and continued to pick apart the holes, runs and riffles. Anglers are some of the most optimistic folks around. Knowing that water level was high, but also that it was continually dropping. The meaning? The fish are going to really turn-on at any minute, because the water level is steady falling. It just makes sense. It makes sense in my head anyway. Persistence. The challenge to stay focused when it is hot and the fish aren't keeping us as busy as we want to be. Oh yeah the fish were coming to the streamers and then braking at the last minute. We started picking up some trends and beginning to bring some fish to the net. Some fish came on the nymph rigs and pretty soon the browns were coming along with the rainbows. I never get tired of the view from behind the oars, or heck from the casting brace for that matter. Somebody said one time "when you push the boat away from the ramp and it picks up the drift there isn't a feeling like it". Leave the day to day stuff behind and just look at the view, watch the big nasty streamers work or just get focused on the dry fly or the indicator... There is always just floating fown the river and having a good discussion that solves pretty much nothing. We fished everything under the surface and didn't really try any dries. One of the reasons was that we were stuck on streamers until the sun came out. Then it was so hot that watching the indicator seemed like the right thing to do. The rainbows were the first to come to the nymphs. I have been just fishing a single nymph rig a lot lately. Who knows why, other than the single nymph seems to bring some of the better fish than a nymph and midge or even a couple midges. Later in the Summer we will create our own midge hatch with the triple midge rigs. Right now in the heat of the Summer the single offering seems to work about as good as anything else on the river, for me anyway. Like I said in the last report Dan got on the video camera to get some footage of fly fishing on the Caney and the fish did not disappoint. We were stopped at a run on low water and it was my turn on the 5 weight. The footage won't make the Drake Film Tour, not only because the guy fishing lost most of his hair, but probably for other reasons we hadn't even considered. I am going to pack the boat for another trip while this thing uploads. Anyway for everyone stuck in a cubical, office or just workin for a livin, hope you enjoy. We went down to St George Island last week and got out on Apalachicola Bay for some red fishing. We didn't go down just for the fishing, we also went down for the great seafood and just to relax. Before we knew it the week and a couple days had past and we were back in Middle Tenneessee. And then, we were back on the Caney Fork for an afternoon float. Dan continued to fish the streamer and began to pick up consistant flashes. We stopped at a shoal and he offered room to throw a nymph. We settled into a nice drift and began to pick up fish. We probably wouldn't have stopped if Dan's streamer had not brought some fish up from the bottom. But, the streamer brought out the fish and the nymph cleaned up. We spent the majority of the afternoon at that run, which was in the shade. 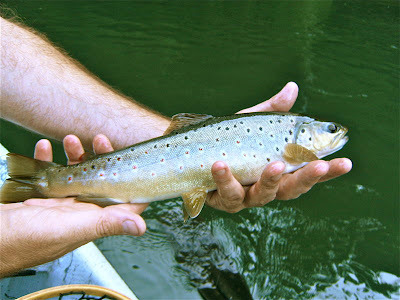 Dan got on the video camera and caught some footage of some takes and fights with the Caney Fork rainbows and browns. We ended our float on the river by fishing the streamer and the occasional nymph. My intent was to throw some top water stuff, but sticking to the plan on my day off was, well, really out of the question and we ended up just doing whatever we wanted. The bugs that are a little more delicate seem to live further downstream. By that I mean the mayflies, caddis and other "softer" bugs. We imagine these bugs just taste better than the scuds and sow bugs that tend to live in the water closer to the dam. I enjoy fishing some of the lower stretches of the river. We did spot some mayflies that looked to be about a size #12 or size #10. There were not as many of the better tasting bugs right now, but we'll start seeing them later in the Summer. Believe it or not everyone doesn't come to the Caney Fork for the fishing. 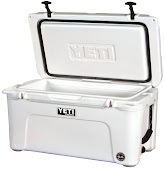 Anyone who has fished the Caney on a hot weekend knows the canoe hatch can be mindboggling. It is a slow moving river when the generation is off, which is perfect for drifting nymphs and very good for canoes. We have spent many a days on the river waiting for canoes to pass or speeding up to beat them to the next hole, just in time to catch a fish or two, then rowing like crazy to the next hole. The Caney is public water, so after a while canoe hatches become part of the challenge. Gaddling.com has put together a piece on lazy rivers and yep, the Caney is right in the mix for best floats. You can read the short article here. After the US Army Corps meeting on Thursday, it was time to reflect on the number of fish, the amount of water release this year vs. last year and all the other information they gave the fisherman, guides and other folks at the meeting. There is no better place to reflect river information than on the river. During our ride to the river we discussed the new ramp that will be built at Stonewall Bridge. I have mixed emotions about the ramp, because of the additional traffic that will be on the river. But additional access isn't all bad, because it opens up more options for floats. The TWRA has been stocking the hatchery brats in the river at a good rate this year. 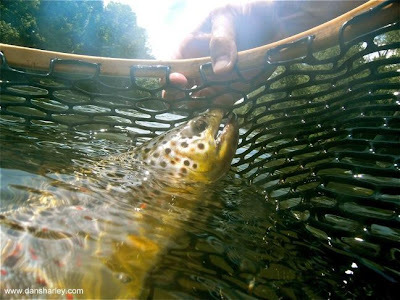 So far they have stocked just under 40,000 fish in the river including 26,000 rainbows. The hope is these fish will keep us entertained between the holdovers that make for good photo ops. TWRA has stocked 6,000 brook trout in the river so far this year. Each trip we have taken lately has produced at least one of these little gems. 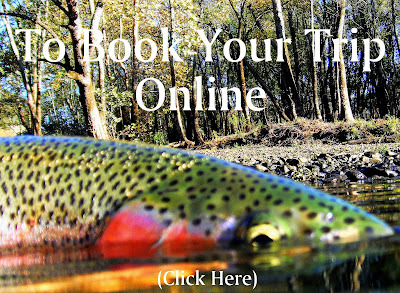 These trout grow at a good rate and some say they grow about 1" per month. If that growth rate is true we should have some nice brookies in the fall and if the conditions will at least remain stable they will be very nice fish this time next year. We rowed the drifter down the river to meet our deadline. We had to be back at the ramp early and continued to hit the best water as we floated along discussing many topics. Anthony hooked up with more of the bigger fish and I took care of the smaller fish throughout the trip. The big spills produce a wide variety of fish in the Caney Fork. The TN Tarpon were not playing the fly rod game on this day. But, the different species keep the day interesting and occasionally the reward will be a good looking bass. We threw streamers at them off and on just to keep the more aggresive fish honest, but the best trout still came to the boat on nymphs.